The Michigan results are certified, handing the Great Lakes state to Trump. The Trump camp failed to request a recount in New Hampshire before the 5pm deadline. 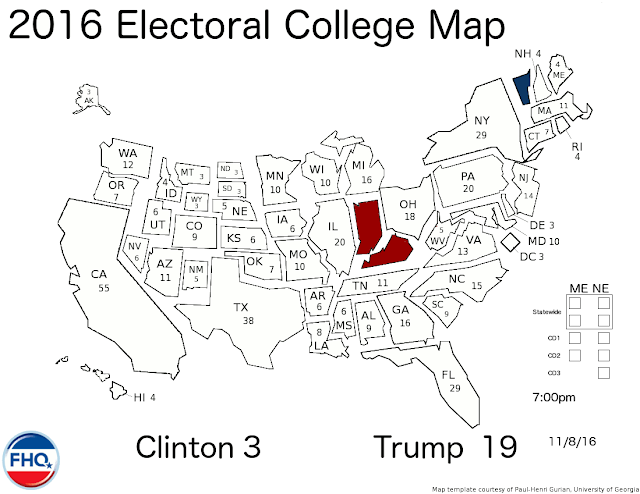 Clinton takes the Granite state's four electoral votes. Arizona added to Trump's column. The AP calls Minnesota for Clinton. That is a narrow hold for Democrats. Wisconsin puts Trump over the top; another flip for the Republican. Alaska stays in the Republican column. And the second congressional district in Nebraska is called for Trump. The Maine call is in and we have the second electoral vote split in the Maine/Nebraska era. Maine's second congressional district follows Nebraska's second district in 2008 in going against the statewide result. Clinton wins the state and CD1 while Trump takes CD2. Pennsylvania flips to Trump. That 20 electoral votes puts Trump within range of 270 (and with some networks having called Wisconsin for him). Trump flips Iowa; something that has been in the cards since at least the conventions. Trump also holds Georgia after a lengthy wait. Utah goes for Trump. He will lag behind Romney there, but still take the Beehive state with relative ease. North Carolina is a Republican hold for Trump. Oregon is another non-Rust Belt leaner to stay with the Democrats. The next round of closings out west put California, Hawaii and Washington into the Clinton category. Trump takes Idaho. 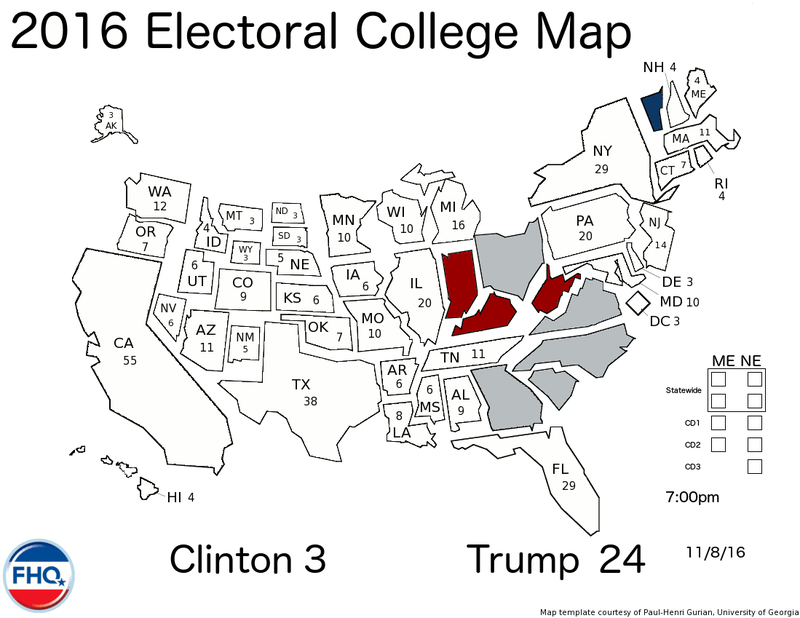 The close night in the Rust Belt extends to the electoral vote count for the time being. Florida follows Ohio as a Trump flip. Understatement alert: That is a big one. Colorado stays in the blue column. The outside the Rust Belt/midwest leaners are falling into place for Clinton. Those in that region are tighter. Ohio goes to Trump and Virginia to Clinton. One of those is bigger symbolically than the other. Missouri to Trump and New Mexico to Clinton. Closings in Arizona, Iowa, Nevada, and Utah. No calls. Montana to Trump. Arkansas and Louisiana turn red and Connecticut falls into Clinton's column. An extended radio hit pulled FHQ away. We will feel in the gaps in time. As for now a big jump for both candidates. West Virginia to Trump. North Carolina and Ohio are too close to call as of now. Wasting no time, Indiana and Kentucky go Trump and Vermont is added to Clinton's column. Let's color this thing in. FHQ will have maps and comments both here and on twitter (@FHQ) all evening. As there were only a few more polls added to the mix on the final day of the 2016 campaign -- or in just under the wire yesterday -- there were only a few subtle changes to the figures here at FHQ. South Carolina pushed past Texas toward the partisan line on the Electoral College Spectrum below, but neither will budge from the Trump column. Both had at various points shown to be much closer than normal. 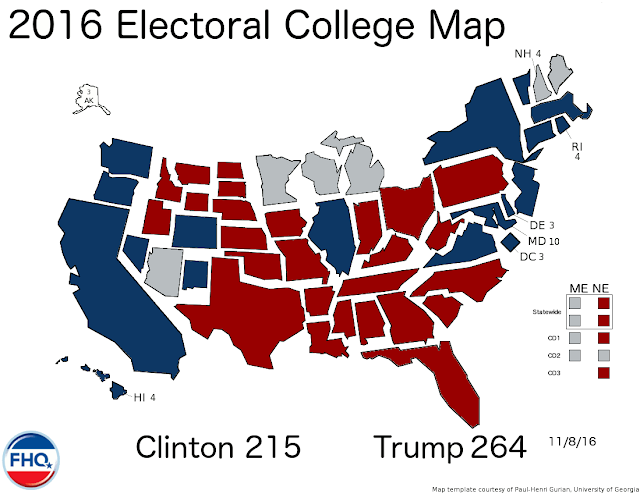 Neither, however, will end up anywhere other than red as the results trickle in. Wisconsin once again traded spots with Michigan on the Spectrum. Similar to the two Trump states above, neither state seems poised to jump the partisan line away from Clinton. 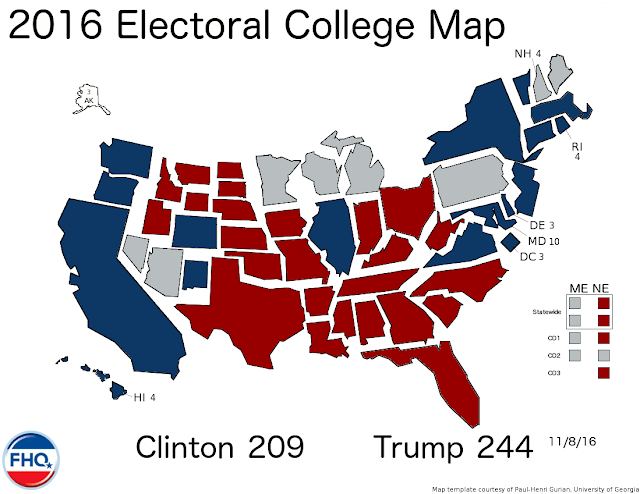 The trajectory of the race has headed in that general direction here at the end, but it is likely that that was more consolidation of partisan support (for Trump) than any wholesale shift away from Clinton or the Democrats. The temptation is there to suggest that the tightening in states like Michigan and Wisconsin is perhaps a reversion to the pre-Obama mean for the pair. Yet, that simply is not the case. 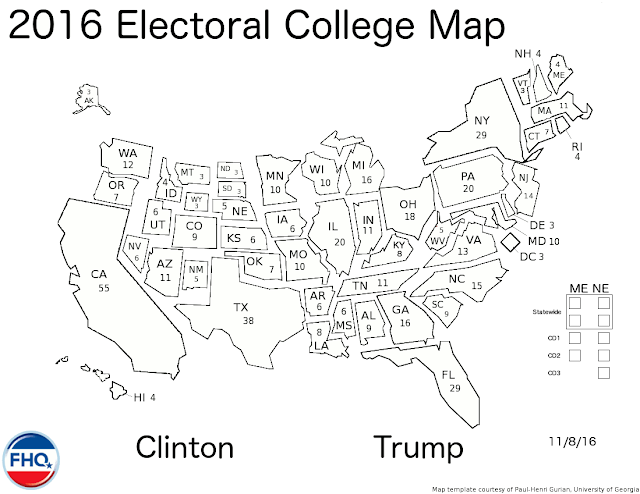 Both are within range of exactly where they were in the Obama-Romney race four years ago. The map and Watch List remained unchanged from a day ago. The map always seemingly had 2012 as a jumping off point. Most presidential elections tend to build on the previous elections. 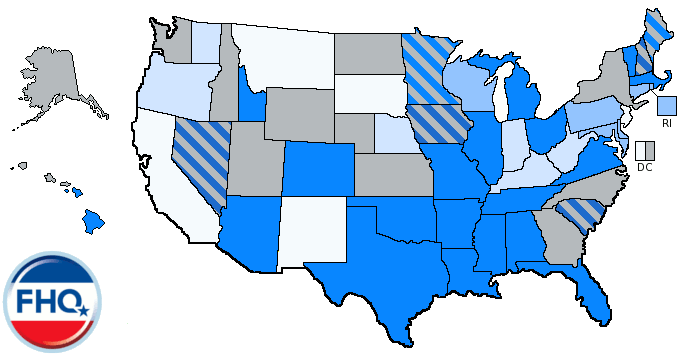 The order of states remains largely the same and the movement tends to be more of a uniform shift one way or the other (with exceptions -- see Utah, 2016). 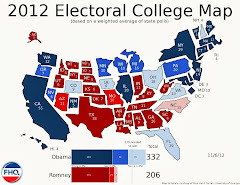 If 2012 was the starting point, then the first map was the 2012 Obama states plus North Carolina and Arizona. Arizona pushed back across the partisan line toward Trump around the conventions and settled in. North Carolina did not. There have been fluctuations from one poll to another in the Tar Heel state, but it, too, settled into the Clinton column. Arizona was not alone in jumping the partisan line over the last few months. The general election campaign witnessed Iowa cross the partisan line into the red and never really look back. Ohio, here at FHQ anyway, was more resistant. While the Buckeye state hopped the partisan line into Trump territory just yesterday, the second debate -- the town hall debate immediately after the Access Hollywood tape was released -- was the turning point in Ohio. The polls shifted toward Trump after that point and the average here shrunk smaller and smaller over time. One final change in comparing the first and last maps was the addition of the congressional districts in Maine and Nebraska. FHQ had not previously focused any on any of them, but added them since there was some data. We will confess that it was probably not enough data, but they were added nonetheless. 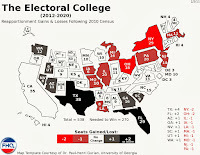 Adding them did shift what had been a reliably electoral vote under the statewide distribution from Maine's second congressional district to Trump's total. The tipping point state has changed over time as well. Virginia was the initial spot where either Clinton or Trump would have crossed 270 electoral votes, but that changed a number of times and often included pairs of states as things split at 269-269 over the summer. That settled down later as the order of the states along the Lean/Toss Up line on the Clinton side of the Spectrum reshuffled. Colorado has been in that position since just before the first debate. And bear in mind, while the states have changed, the position of the tipping point state has not. The order has been that stable. FHQ has the least confidence in a few areas. First, Ohio is very close; the closest of all the states here at FHQ. It would not be a surprise if if jumped back over the partisan line into Clinton's column. At the same time, that is not what we are predicting. Second, the lack of data from Maine's second congressional district does not inspire confidence. The recent polling has favored Clinton by narrow margins, but a handful of Trump-favorable outliers from the late summer -- even when discounted in the weighted average -- still has that one tipped toward Trump here at FHQ. Tough-to-poll Nevada is always a bit of a problem child. It has been biased toward the Republican (compared to the final results) in each of the last two cycles. It would not be a shock if the Silver state is not a more comfortable win for Clinton. But again, that is not the prediction here. 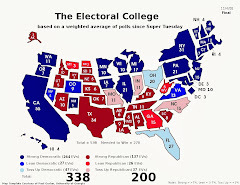 2 The numbers in the parentheses refer to the number of electoral votes a candidate would have if he or she won all the states ranked prior to that state. If, for example, Trump won all the states up to and including Colorado (all Clinton's toss up states plus Colorado), he would have 275 electoral votes. Trump's numbers are only totaled through the states he would need in order to get to 270. In those cases, Clinton's number is on the left and Trumps's is on the right in bold italics. 3 Maine and Nebraska allocate electoral college votes to candidates in a more proportional manner. The statewide winner receives the two electoral votes apportioned to the state based on the two US Senate seats each state has. Additionally, the winner within a congressional district is awarded one electoral vote. Given current polling, all five Nebraska electoral votes would be allocated to Trump. In Maine, a split seems more likely. Trump leads in Maine's second congressional district while Clinton is ahead statewide and in the first district. 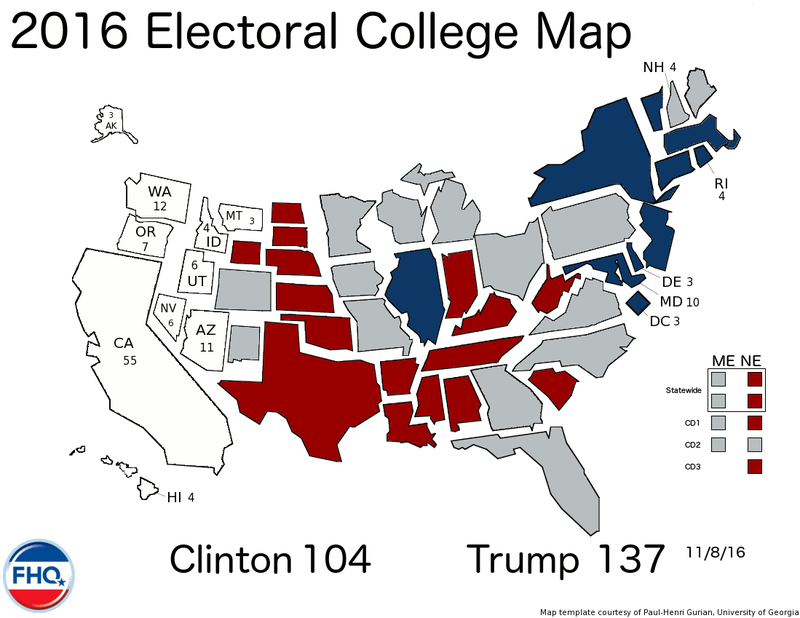 She would receive three of the four Maine electoral votes and Trump the remaining electoral vote. Those congressional district votes are added approximately where they would fall in the Spectrum above. 4 Colorado is the state where Clinton crosses the 270 electoral vote threshold to win the presidential election. That line is referred to as the victory line. Currently, Colorado is in the Toss Up Clinton category. 1Excluding the two head-to-head online panel surveys in Utah lowers Trump's average advantage there to 8.48 points. Those polls are outliers in view of the majority of surveys in the Beehive state during 2016 and serve as an anchor on the data. The change would shift Utah within the Lean Trump category, closer to Toss Up Trump. McMullin garnered 24% in the YouGov survey and 25% support in the Trafalgar survey. He currently has an FHQ graduated weighted average share of support of 23.39%, trailing both Trump and Clinton. Ohio jumped the partisan line from Toss Up Clinton to Toss Up Trump, but note the average: +0.01. The Buckeye state is close here at FHQ. Nevada rejoins the Watch List, slipping under the Clinton +1 threshold, but the Silver state has been hovering there. Colorado slides off the Watch List. It is now just a bit more than a point from the Lean/Toss Up line (+5) on the Clinton side of the partisan line. The ZiaPoll survey of New Mexico -- given the sample size, it was the whole state -- drew the average in a bit further. It has tracked down to about a six and a half point lead for Clinton in the Land of Enchantment. That pushed New Mexico down to the lower half of the Lean Clinton group of states on the Electoral College Spectrum. The Trafalgar and YouGov surveys were enough of a drag on the FHQ average in Pennsylvania that the Keystone state slipped just under the Lean/Toss Up line. 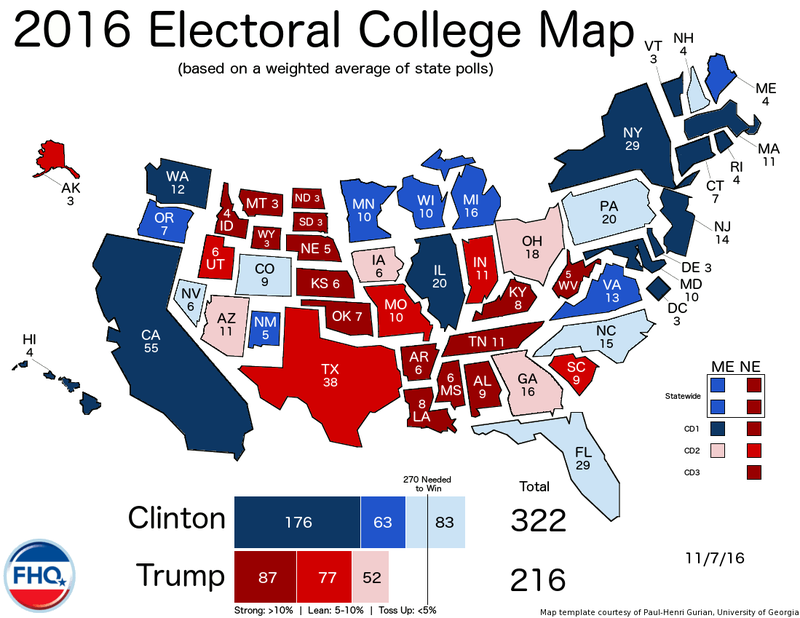 Pennsylvania, then, follows New Hampshire as states that have until recently been just above that line but have hopped over it into the Toss Up Clinton area. Both remain clustered around that line, however; just on the opposite side. That move also flips Pennsylvania on the Watch List, but keeps it in the same position on the Spectrum. The Trafalgar survey of Michigan is the first to show Trump ahead since 2015. It may be a sign of something in the Great Lakes state or it could be an outlier (balancing out that MSU survey from last week). Either way, it decreased the average margin enough to ease Michigan past Maine on the Spectrum. Also, Utah once again traded spots with Indiana, pushing to the very end of the Lean Trump area. The new polls out of the Beehive state nudge Trump even closer to 40 percent in the averages. Again, that will be enough to keep Clinton and McMullin at bay there and Utah in the Republican column. The Breibart wave of last minute Gravis polling releases mostly confirmed the state of the race in each of the states. There was some shuffling among the New Mexico, Michigan, Wisconsin cluster in the Lean Clinton area. New Mexico bounced back slightly after pushing down that column earlier in the day. Everything else held steady. Barring anything unforeseen or any straggler surveys, this is likely what the final map will look like on election day. There are a few polls yet to be added into the dataset (the non-Breitbart wave of Gravis polls), but the expectation is that that will not alter the bottom line any if at all. It will not where it counts in any event: Clinton 322, Trump 216.